Oleeva® Scar Shapes are specially designed to treat scarring from breast, abdominal and other surgical procedures. Made of Oleeva® Fabric, Scar Shapes are cut to ensure the correct placement and coverage for your procedure. 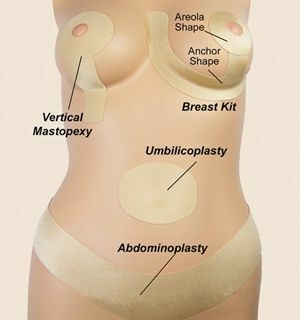 Oleeva® Scar Shapes are ideal for use under surgical garments or ordinary clothing. Oleeva® Scar Shapes contain no messy gels or pastes. Thin, soft and flexible—they’re so comfortable, you’ll forget you’re wearing the latest technology for scar management! The inner surface is made of Silon®—used around the world for the treatment of burn scars for more than 20 years. The outer surface is covered with a silky fabric for a touch of elegance and optimal comfort. Using Oleeva® Scar Shapes and Fabric couldn't be easier! • Reuse every day for up to 6 weeks!